← What graveyards did you visit on vacation this summer? 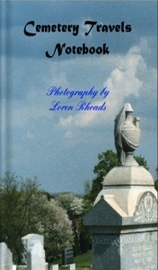 Loren Rhoads’ “Cemetery Travels Notebook” is the perfect notebook for a taphophile. It’s a lined notebook for all your note-taking needs, and it’s also filled with beautiful full-color photos of monuments from the U.S. and beyond.According to Ms. Rhoads, it’s a great place “to keep field notes from your own cemetery adventures.” It’s also just a nice journal for writers inspired by great statuary. The journal consists of 80 lined pages and 20 full-page color photos from Paris, Tokyo, Sleepy Hollow, San Francisco and more. Ms. Rhoads is the editor of Death’s Garden: Relationships with Cemeteries and writes the blog at CemeteryTravel.com. Here’s the link to all the new cemetery book reviews on The Cemetery Club.com. You can enter to win a copy of the Cemetery Travels Notebook your own by traveling back in time to yesterday’s Cemetery Travel entry and telling me: What graveyards have you visited on vacation this summer? This entry was posted in Cemetery book review and tagged Cemetery Travels Notebook, taphophile. Bookmark the permalink.